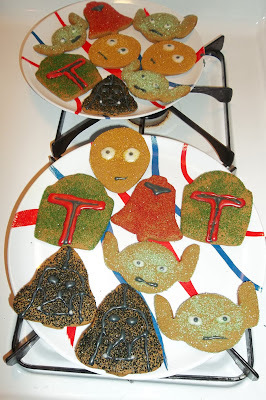 I like making Gingerbread Cookies for friends and had once already in 2011 tried to capture genre characters with Christmas cookie cutters (and one Easter Egg cutter). I decided this year to make all Star Wars characters. I used new cookie cutters from a Halloween set I bought this year and from a Christmas set I had purchased a few years ago. 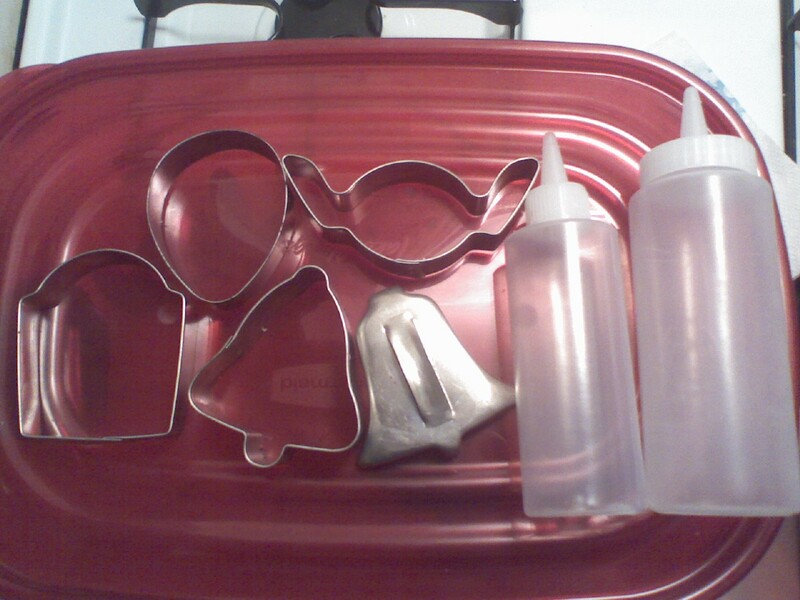 All were available in boxed sets from Wilton (except of course the vintage one). For Boba Fett I used a tombstone cutter, for Yoda I used a spider (turned upside down as suggested by Sweet Sugar Belle) and for Darth Vader I used the newer bell. I used a vintage cutter for the Emperor's Royal Guard and reused an inverted Easter Egg for C-3PO. I bought colored sugar from Michael's. I bought yellow sugar in November to make Autumn leaves for Thanksgiving. I also purchased red and green then in anticipation of Christmas. As I put together my ideas, I knew I wanted the green for Boba Fett and wasn't sure what to do with the red sugar until I remembered the Royal Guard. Then I had to think of what to use, as the modern bell cutter I was using for Vader was too rounded. After looking through our collection of old cookie cutters for inspiration I happened upon a vintage bell that was more sharp and angular looking, perfect for a Royal Guard helmet, so I had a cookie to use the red sugar on. Armed with red, yellow and green sugar I then purchased light green sugar for Yoda and black sugar for Darth Vader. I used the McCormick recipe for gingerbread cookies and pressed each cut raw cookie into a bowl I had put some of the sugar in and then baked them according to the recipe. 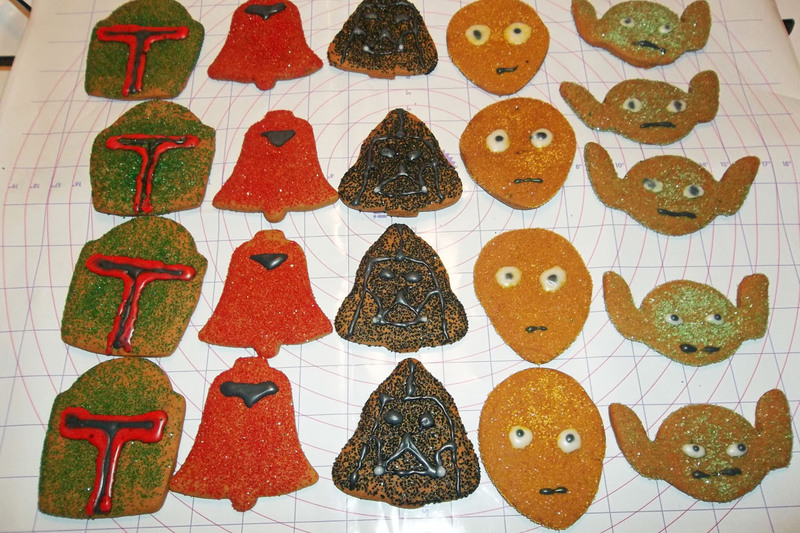 I frosted the Royal Guard cookies first since they took the least effort and I liked to have one set done right away. Then I did C-3PO since he was easy as well, then Yoda since he used the same frosting and I could tell myself I was 3/5ths done already. Since I was feeling good about myself at this point I decided to tackle Vader so I could end with something easier like Boba Fett. I like your method of how you tackle the project, how you broke down your process and ideas.